Just a few weeks ago, Colombian filmmaker Catalina Arroyave Restrepo premiered her first movie at the international festival SXSW. The path that has brought her to this moment has been anything but short. On the contrary, she’s always wanted to be a director and has worked very hard to get here. 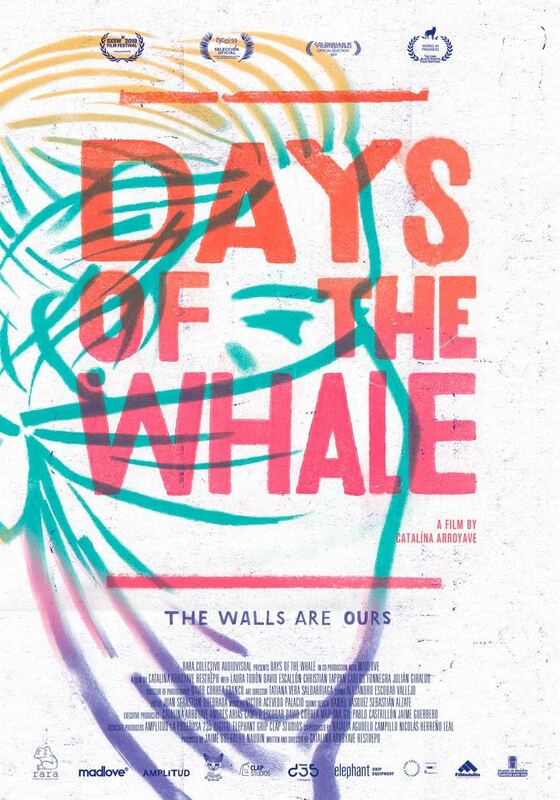 The trailer of her movie The Days of the Whale is enough to move the fibers of those who have grown up in Medellin, the city it takes place in. The existence of a story that faithfully represents so many of the diverse elements of the city is exhilarating. By freeing herself through her art, Catalina frees an entire city that has often been confined to myopic and sensationalist views in the film industry. We talked about her debut movie, directing films as a woman in Latin America, the path traveled, and the road that remains. Don’t miss this thrilling conversation. MF: How did your career start? Why did you decide to become a film director? CAR: I’ve written since I was very young. I grew up being very close to my uncles, my parents, and my grandmother because I have no siblings and for a long time they were my big company. Listening to all their stories, the discussions, and the conversations they had, of course, I started to have an overflowed imagination, and from a very young age, I began to write. I wrote stories and poems, and then I became very interested in music. When I was in school, I sang, and I also wrote a play. When it was time to think about what I wanted to do in life, it seemed to me that movies could bring together all the things that I loved. For my family, it was difficult for me to go to study outside of Medellin, and at that time there were no film careers in the city, so I started studying communication at EAFIT University. It took me a long time to make films, but I always knew it was something I wanted to do. What obstacles have you had to overcome, especially as a woman, in the Colombian and Latin American film industry? I’ve thought many times about that, how being a woman has affected my path, and I have several considerations. The first is that you have to navigate things as small as family perceptions. For example, many families in Medellin, including my own, think it’s more frightening for a woman to go to another city to study in an artistic world. I think if I had been a man, it would have been different. From things like that the road starts to have to go through other places. Look, I had to wait until the fourth semester of my career to be able to go to Argentina to study filmmaking. Another issue is distrust. A lot of people say 'why are you going to do that? ', 'It's tough,' 'why are you going to start directing?' and added to that, especially when you’re starting, you feel embarrassed by the stories you want to tell. One constantly thinks, ‘does my point of view belong in another place? Is this going to matter to someone? Is this going to be valuable?’ At first, it was challenging for me to believe that what I had to say would interest others. When you ‘jumped’ did the attitude of the people around you, of those who didn’t believe in you, change? Or are those negative voices always present? Fortunately, I had my friends from Rara who are wonderful [Rara is an Audiovisual Collective co-founded by Catalina in 2010]. We built an eco-system in which we protect and help each other a lot, and since we’ve been working together for so long, for me that was a significant force; feeling supported by my friends. When you have many voices against you, you have to try to surround yourself with people and voices of encouragement in which you believe. My friends have been fundamental pillars in my life. For example, writing the script, I would say 'this is useless, it's garbage, why am I doing this? -because it was three years of writing- but when that happened someone always appeared saying 'go on, continue, this is worth it.' So I think that has been fundamental. You have to have a close circle to cheer you on, one to help you overcome those moments of difficulty. How much time passed between the moment you started writing the script, and the moment you finished the movie? I started writing the script in 2014, so it was five years of work. For people who haven’t seen the film, can you briefly share what it’s about? Of course. The film tells the story of Cristina and Simón who are two friends, muralists and graffiti artists who live in Medellin. They talk and walk the city making it their own through their art. Cristina is going through a difficult time because her mom has left town and she has had to go live with her father, with whom she has a distant relationship. She takes refuge in Simón, her best friend, and in a collective house they’re part of called La Selva. Because of the denouncing activities the collective does, they receive a threat, a scratch written on a wall in front of the house. Cristina and Simón decide to paint on that threat the mural of a whale, and that triggers a conflict with the powers that surround them. Where did the idea to tell this story come from? Several things happened at the same time. The first was that I studied in a private school, in a nuns school and then I went to study at EAFIT. When I left university and started working in film, I crashed with a lot of realities of the city that had somehow always been very close to me, because I grew up next to the Comuna 13. But I was a bit protected of specific circumstances that have been the reality of our city for decades. I started working as an assistant director in different films and shorts and to understand that there were territories in our city that were not neutral and we had to ask permission from the people who ran those territories to shoot there. I was shocked by that logic, which is still the logic of our city in many areas, and I began to feel the need to talk about that, the territorial control of gangs. Additionally, I’ve been a spirit that has encountered different things I haven’t agreed with for a long time, and I needed to talk about that; about growing up, growing up as a woman in the city of Medellin. All of that came together with the fact that I’m great friends with an urban muralist and graffiti artist, who has been telling me stories about painting on the streets for a long time. I saw his work, the work of other graffiti artists and other muralists and I started to think that urban art was a great way to talk about growing and about the territory, but also to do it through a visual experience that was powerful and interesting. I thought, 'If I'm going to make a movie, I want it to be seen,’ and urban art seemed like a compelling way of doing that. Tell us a bit about the role of music in the movie. Growing up I always sang, I was very interested in music, and when we went to choose the songs for the movie, I was in love with many. I had noticed that urban art in Medellin, which has a vital Hip Hop component, also has other very interesting exponents, and I began to feel that the film could be a platform for us to listen to beautiful genres of the city like Salsa and Rock N Roll. Finally, the film has eight songs and only two -a reggaeton and bolero- are not from Medellin, the rest are all from the city, and that has been very gratifying. The film is a symptom of the current moment of Medellin, I have said it several times because I really believe it. Beyond the fact that I have told something that interested me, I know that it has also been a platform for different artists. The creative energy that circulates in a movie is much more than the energy of the director, in reality, there are many people involved, and they all start to give something to the film. Necessarily it becomes an experience that exceeds one's own. It’s a collective experience, and everything that is there contains all the people who have been contributing something to the final product. ‘The Whale’ is really a symptom of many people, and since we’re all from here, it is a symptom of the city. Until now, what has been your biggest surprise with the reactions to the movie? This has been awesome for me. Since the process was so long, many times, one loses confidence. In the montage that lasted a year, we made and fixed a lot of mistakes. We presented many versions of the film to different people, so one gets used to the criticism being very hard. What has been very surprising, very beautiful, is that really a broad audience has connected with what is in the film. When you make a movie, you put several things that are messages for people to comprehend, stuff they have to decipher, understand, and decode. One often wonders 'will all these questions, concerns, and research, be read and perceived by the viewer?’ And what has happened to my great joy is that many of those concerns have reached those who have seen the movie and that is beautiful, it’s very exciting! What’s your advice for the next generation -and especially to the women- who dream of achieving what you’re accomplishing at this moment? I think it's important to demystify filmmaking a bit. Some people believe that being a film director means being surrounded by stars, glamor, red carpets, and champagne. This couldn’t be further from reality. The direction of a movie involves a lot of work. It’s a process where you have to go deep into personal things, and doing that is rarely easy. Then you have to be willing to open up and expose yourself to criticism. In other words, you have to be prepared to work hard. It also seems important to me to say that a few generations ago in a city like ours, there was a collective feeling that it was complicated, almost impossible, to make a film. Thanks to the experiences that we’re beginning to have, it’s increasingly evident that it is possible, that it can be done and that it can be done constructively. So what I would say to the next generation is prepare yourselves, put on your sneakers and start, because obviously it’s possible and it’s a beautiful experience, but it implies a long path of hard work. *This article is also available in Spanish, click here to read it.